Fish Preferred: Kai Po Che! This is not a review. Just a few spoiler-ridden thoughts on the movie, which I need to get out of my system. People all over the world today, including those in urban India, lead increasingly homogenised lives. We watch the same American television programming, use the same kind of brands, and eat the same kind of food. It’s not just about a job anymore, any job that would support a family back home. Our aspirations for a career revolve around the more first-worldly ideal of finding one’s true calling. Likewise, our movies have come to reflect this (or a more exaggerated version of this) reality. Take the toast-making, skydiving trio of Zindagi Milegi Na Dobara. I can’t help but feel that they would fit in rather more comfortably in New York than Mumbai. Transplant the leads of Dil Chahta Hai to London, and it would make absolutely no difference to the narrative. Which is probably why films like Cocktail and Ekk Main aur Ekk Tu completely dispense with an Indian backdrop. And which is why Kai Po Che is the most refreshing film I have seen in a long time. 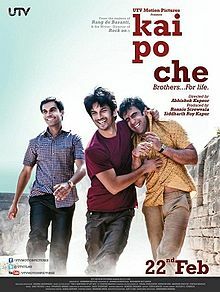 Kai Po Che is an Indian film in every sense of the word. Yes, of course there is song-and-dance, and Manja manages to evoke an atmosphere that reams of dialogue could possibly never establish. But more importantly it’s the world Govind, Omi and Ishan inhabit that makes the film resonate so much. You can see the dust, the sweat. Here, an eleven year old’s most pressing concern is the goti championship in his neighbourhood. A young man longingly fingers the plastic covered seats of a new car. Dates are carried out in extreme secrecy. Travelling inside a Roadways bus is more uncomfortable than on the roof. Sure, finding love is important, but achieving other goals (monetary, political or, otherwise) more urgent. This is a movie where you cheer the Indian Cricket team on for a match you know they have won. Because you know cricket can resolve feuds between friends. That it can magically paper over religious fissures. You pray the ending doesn’t enter the territory, you know it’s heading for, when a dazed Omi finds his Mama injured by Ali’s dad. And when the fatal shot hits, you hold back tears, wishing that Ishan and Govind could sort it all out, Omi and Ishan could sort it all out. If only Bolly-wood can now come up with an ode to female friendship. One that preferably does not involve two pretty girls falling for the same guy. Ok here's mine: What I felt after the last scene was that this is the most sensible representation of India that Bollywood has conjured up in the past 3-4 years, given the trend is to make utterly stupid 100 crore grossing films set in semi-urban/ rural India where a shirt-remover cop does monkey steps(and watching him you don't know whether to laugh or cry or lament) or the glossy ones that you've talked about above. It had all the right ingredients of cricket, friendship, religion pitched in. Everything is so real that your tears flow on uninhibited. Spoiler alert/Side Note: Ishaan HAD to die in the end because he was so pampered and self-obsessed that we wouldn't have fallen in love with him otherwise. Also Zoya Akhtar is female, and she made ZNMD. Good enough credentials, don't you think? And ooh I was in love with Ishaan, right after the earthquake relief camp scene. Didn't need him to die at all. agreed! a truly indian film through and through. Theres something about these whole "not in india but for indians" films that somehow somewhere limit how much one can relate to them. and NO! Ishan should not have died! :( a near fatal injury that he would recover from would do just as well, although it would probably not make for as much as a poignant ending..but it was too sad.